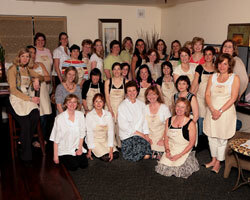 Thank you for hosting our women's foundation for a wonderfully enjoyable night at Maverick Cooking Studio. We couldn't have asked for a more perfect experience for our members and their guests. You created an interesting and satisfying menu that pleased even the most accomplished cooks in our group. The facility at Maverick is delightful, both for working and cooking and for relaxing together and enjoying a meal. Even for 36 women! Above all else, I am most appreciative of all you did to insure that we enjoyed ourselves... from the lovely table settings to the warm and friendly kitchen discussion. Your attention those details transformed a nice night into an extraordinary one. It is a pleasure to work with someone who enjoys what they do. Thank you for sharing that joy and your talent with us.